... 1952, Jane Brigode (right) died 82 years after she'd been born in Rummen, Belgium. A feminist and political activist, she joined Marthe Boël in spearheading women's political organizations. 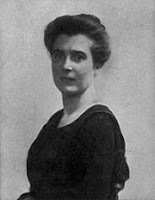 In 1920 the 2 held the 1st women's conference; a year later, they cofounded Union des femmes liberales de l’arrondissement de Bruxelles, and 2 years later, they and Alice Buysse cofounded the National Federation of Liberal Women. Brigode also served as co-President of Belgium's Liberal Party during World War II, from 1940 to 1945.